On his way back from a crusade, King Richard the Lionheart fell into the hands of his Babenberg opponent's bailiffs in Vienna and was imprisoned in Dürnstein Castle. His lover Blondel discovered his whereabouts with the help of a love song they had written together - the ransom could be paid, and Vienna's city fortifications financed with it. 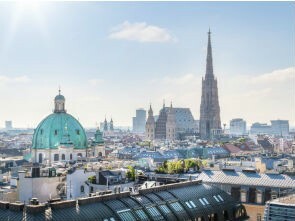 Vienna hence owes her very existence as a city to a gay love story. The Austrian capital also has a lot to offer today: the Rainbow Parade is distinguished by one of the most impressive routes imaginable for any gay pride event. The Rainbow Ball and Life Ball favour Vienna with two society events that have come to outrank the legendary Opera Ball and are basking in international fame. But the metropolis by the Danube also has plenty of recreational value to offer all year round, not least of all the 21 km long river island traversing it near the city centre with several official nudist beaches - meaning that gay bathing and cruising is not only confined to the area known as "Toter Grund" at kilometre 6.